After seven years of debilitating back pain, a company director from Leeds says his life has been transformed, thanks to new developments in spinal fusion surgery. Graham Bickerdike, 64, a married father and grandfather, suffered from severe back pain, which affected his life both at home and at work. In the last twelve months the pain worsened to the point where he was only able to walk 50 yards before having to find a seat. Last year, while on holiday with his wife Sylvia, the pain was so severe Graham had to sit down most of the time while his wife went exploring on her own. “I spent more time in pain than not over the past seven years and my quality of life was worsening. It hurt when I stood. It hurt when I walked. Sitting down was the only time I felt relief. There was so much in life I was missing out on,” said Graham. It was found that discs in his lower back had deteriorated to the point where pain medications were no longer effective. Graham tried various other treatments including steroid injections and physiotherapy, but they only gave temporary relief and he needed a long-term solution. His GP referred him to Mr. Deb Pal, consultant neurosurgeon at Spire Leeds Hospital, who immediately arranged for an MRI scan. The results showed scoliosis with spinal stenosis – degeneration of spinal discs as well as a curvature of the spine. Mr. Pal discussed the options with Graham, which included standard surgery or another option – minimally invasive XLIF (eXtreme Lateral Interbody Fusion) surgery, which is currently done by a relatively small number of surgeons in the UK. Graham decided to go ahead and had the XLIF procedure in November 2013. Mr. Deb Pal said Graham was an ideal candidate for the XLIF procedure, which uses an approach from the side of the body – reducing the disruption to muscle in the back that occurs during traditional back surgery. Surgery involved two stages: the first stage involved partial correction of his spinal curvature and decompression of the spine by removing the worn discs and inserting two plastic cages filled with bone graft in the space to support the spine and correct curvature. During the second stage, four weeks later, Mr. Pal removed further pressure around the nerves, stabilized the spine and corrected the spinal balance. The first stage took two hours and the second stage, four hours. “Although the two procedures could be done together, this would have meant a prolonged procedure. I felt it would be best to do the procedure in two stages rather than expose Mr. Bickerdike to a prolonged anaesthetic,” said Mr. Pal. Following the first stage Graham was discharged after 24 hours and after the second surgery he was discharged after four days. 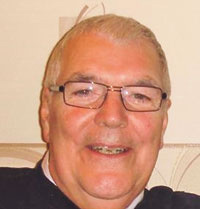 Graham returned to work in January and is due to retire from his role as director at an engineering company in Leeds in April. “I’m recovering wonderfully well and am now pain free! I’m building up my walking distance and can now walk half a mile. I’m looking forward to when I can walk my dog and to doing more activities with my grandchildren.